Your Prime is Our Priority! Choose Only the Best for Your Business! 2019 Ultrasound Training Dates Are Set! September 16th-September 20th- Spots Are Limited! The Cup Lab®, LLC is the original ugc approved centralized ultrasound processing lab. 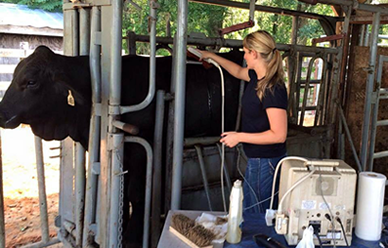 Originating from the CUP Lab at Iowa State University we currently provide carcass ultrasound interpretation for progressive beef producers in the United States, Canada, and South America. Rooted in research, we have become the "Gold Standard" for interpretation of carcass traits using ultrasound. Schedule your CUP Lab technician today! Read the latest article "By the Numbers" from Stephen Miller, Angus Genetics, Inc. Learn how far ultrasound collection has pushed the accuracy of genomic predictions. "Phenotypes are the "fuel" that make the genomic engine run!" Why upgrading technology isn't an option for your business and all breeders. UGC Approves Three New Hardware Systems for Capturing Carcass Ultrasound Traits for CUP Lab®, LLC. Find the Press Release Here and our Industry News page! Sign up for our mailing list to stay up to date. Join Now!